Rotary desk organizer makes it simple to keep your desk or common areas organized. 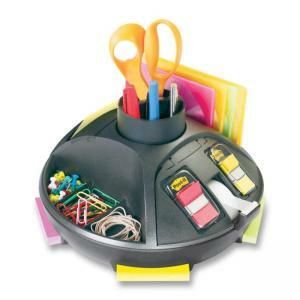 Organizer rotates 360 degrees on a nonskid bottom. Vertical and horizontal compartments offer spaces for writing utensils, paper clips and notes. Organizer includes Post-it Notes, Post-it Flags and Scotch Tape.